Both Restless Leg Syndrome and Leg/foot cramps are symptoms associated with Fibromyalgia. I know that after walking in heels, my muscles spasm and cramp for hours afterwards, when I’m at rest and in bed. They are so intense, that I am unable to sleep through them. Increasing water intake, as well as taking a Magnesium supplement can help somewhat, but on a really bad night, nothing seems to work. Strangely enough (and without much of an explanation), after poking around the internet, as well as newspapers and magazines, one might find the suggestion to put a bar of soap under the bottom bed sheet, to relieve both RLS and leg cramps. Seems a bit far fetched. It turns out that this remedy inexplicably has helped many people. For instance, my grandmother has been suffering from leg cramps for an extended period of time. She hadn’t gotten a full night of sleep in years, due to having to get up every few hours, to walk around until the cramps subsided. She continuously read about “the soap remedy” and thought it was just too ridiculous to try. Eventually, she gave in (and decided she wouldn’t tell anyone, as she didn’t want anyone to think she was “losing it”). She certainly didn’t believe it would help. From that day on, she has slept through the night, every night, with but one night of very mild cramping. I just learned about this and plan to try it myself. “The People’s Pharmacy” (a website), sells sets of three lavandar scented “bed soaps” for under $10. These bars are long and flat, making it a bit easier to keep under the sheet without ruining the aesthetics of your bed. Another product available are small shards of soap that are intended to be worn in socks, to prevent day time RLS and cramping. Don’t fool yourself into believing that there’s no way this simple bit of advice won’t work for you, due to the severity of your symptoms. Many who have experienced completely altered lifestyles due to the symptoms and lack of sleep, have been alleviated of their pain and discomfort almost entirely (and consistently). While this remedy may seem over the top, it’s worth trying if cramping or restless leg syndrome associated with Fibro are keeping you up at night. For those with Fibromyalgia, a good night’s sleep is the absolute most important step toward beginning to feel better. Nothing is more simple than placing a bar of soap underneath a fitted sheet. If nothing else, you may wake up smelling a bit better than the norm. A bar of Ivory soap (Ivory is a very gentle, non-irritating brand) can be purchased from any drug store (or even gas station) for well under a buck. Assuming you aren’t allergic to the bar soap you choose, there are absolutely no possible side effects, unlike those of medications prescribed for the same symptoms. Place the bar of soap underneath your fitted sheet… and see what your night turns out likeNext time you are experiencing RLS or cramping, do *not* use the soap method and see if you notice any difference. This experiment is best for those with only temperate cramping or Restless leg syndrome, as anyone with extreme symptoms should immediately notice the difference. Of course, this method isn’t guaranteed to work, and may not be the answer for everyone. However, this strange remedy has helped a staggering number of those who suffer from leg cramps and Restless Leg Syndrome. How does it work? There’s no answer, just as there are few answers as to what might cause Restless Leg Syndrome. Additionally, Magnesium supplements are thought to help both symptoms. For cramping, remember to stay hydrated and stretch throughout the day. Success stories? We’d love to share them within this blog! Contact: info @ projectfibro dot com! I have been trying the soap-in-bed for RLS now for 30 days and it works!!! I don’t know how to break it to my neurologist, so I may just have to keep it a secret, however, we need to spread the word to everyone who suffers from RLS. Another 2 people I have suggested it to have also been helped!! This is the most comprehensive information on fibromyalgia that I have ever seen. I found this website from a comment posted at Your Child’s Health Assets, my website. As a former fibromyalgia sufferer I know from 10 years of laboring under its influence how terrible this disease is. Was able to conquer it after five years of incredible pain with a food combining diet. In three days I was sleeping the full eight hours at night, before the diet I was in bed from pain and fatigue 12 to 16 hours a day. My final cure five years later was a result of a spiritual miracle. Nevertheless it is taking me six years for my body to regain its health. My muscles were set in homeostasis pain all the time overreacting to even the most gentle exercises or light work. The section in your pulldown menu on mentality was the key to my being able to conquer this muscle dysfunction. Did you know that in England they don’t call it Fibromyalgia, they call it Myalgia Encephalitis. I have a friend who lives in England and the suffering from it, Ian is in his early 70s and was diagnosed just this past year. This last e-mail I could tell he was disillusioned about any kind of cure. I’m going to copy this URL send it to him and a few other friends of mine that have Chronic Fatigue Syndrome. I have been meaning to write Ian about my 10 years of experience with Fibromyalgia, this website has encouraged me to post an article on my website, which is about health and nutrition, on the subject. I use the “soap method” for my RLS and it works pretty well. For nights that are extra active and irritating, I also use Hyland’s “Restful Legs” homeopathic remedy. A pill or two under my tongue (which is great for keeping in the nightstand so I don’t have to get up for a drink of water to wash it down) and the legs settle right down. What is the soap method? 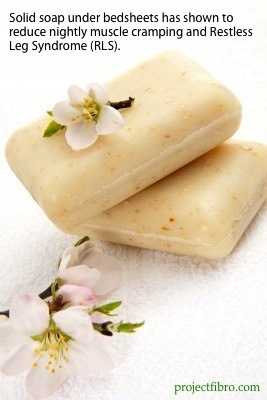 This is the soap method: http://www.projectfibro.com/fibromyalgia-news/soap-for-cramps-rls.html Basically you just put any solid soap underneath your fitted bed sheet, near your feet, and sleep with it there! My best freinds and family scoff at me simply because I usually suggest making use of a number of natural remedies for health problems. Even using a netty pot for a nose cold sends these folks into a tailspin off to the medical doctor in search of antibiotics. If perhaps people would simply just utilize a bit of age-old knowledge, all of us might not have resilient bacteria strains to the amount we do. I find that putting a cut off piece of ivory soap in my sock relieves my RLS all night. I have cut the feet out of a pair of cotton socks and just wear the upper tubes. I find that the soap touching my skin relieves my symptoms all night. I have been using this for a week and after suffering for many years, I am now getting a restful nights sleep. This really works for me. Sorry to hear that. I’ve heard that the soap tends to work BEST for cramps, but does sometimes work for RLS as well. I don’t blame you for not wanting to take the narcotic medications. I’ll continue to research and will post if I find any other natural remedies. I have actually also heard that acupuncture has been successful for several people!